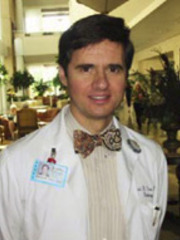 Dr. David R. Vera is presently Professor of Radiology at the University of California, San Diego. His principal focus is the design and synthesis of targeted diagnostic agents capable of measuring receptor density and affinity. Dr Vera began his career at U.C. Davis, where a colloaboration with Drs Kenneth Krohn and Robert Stadalnik produced Tc-99m-galactosyl-neoglycoalbumin, the first technetium-99m labeled receptor-binding radiopharmaceutical and the first to be approved for commercial human-use. Dr Vera’s current research uses receptor-binding technology for sentinel node mapping protocol for melanoma, GI, breast, and prostate cancer. The new agent, Tc-99m-DTPA-mannosyl-dextran (also called Lymphoseek), was developed in collaboration with Drs. Carl Hoh and Anne Wallace and is currently in a Phase II multi-center clinical trial for breast cancer and melanoma.